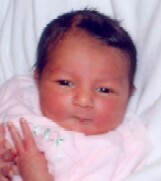 Dr. Samer Sunna and his wife have the pleasure to annouce the birth of their new Little Angle "Masa". Waiting patiently for the signal, wide awake and ready to go. It is now that all the preparation and hard work will finally pay off. All the practice and all the breathing will have to be put to use. The coach is ready and willing and the pupil is wishing and wanting. No more false alarms, they are much too close together. The months of wondering are approaching rather quickly. The car is packed and the plan is made. That time has come to make our way. the last string of events before she blows. Pulling up to the area and getting all the help. Doctors and nurses come running as I prepare for the event. There she goes, through the doors, as I wash-up and put on the greens. waiting for the Doctor and feeling the exasperation. Push, push ,breath, breath, cast your eyes on that designated point. wish she would let go so the blood would flow. it's half way out, it's that time. Kicking and screaming with hands all around. Masa is the name, we have found. We as Johealth Team send our best wishes to the Birth of the Little Angle "Masa"